Gather up your scouting toolkit (including clippers and trowel) and head out to the fields. Then use garden clippers and slice through the stem at the base. If more than half the area of the stem is blackened, blackleg has likely reduced the yield of that plant. How to rate a crop for blackleg. If blackleg is higher than expected even with a fungicide, check notes to see the timing of the fungicide. Read about blackleg resistance and management. Be sure to examine the roots of plants at the field entrance, low spots, areas near to waterways/runs, and areas with premature ripening. Light or severe infection has essentially the same risk for spreading the disease with equipment. If galls are present, the best management at this stage is to prevent spread within the field, and certainly from field to field. Read more. Small growths on roots might not be clubroot, but you can get these analyzed to make sure. 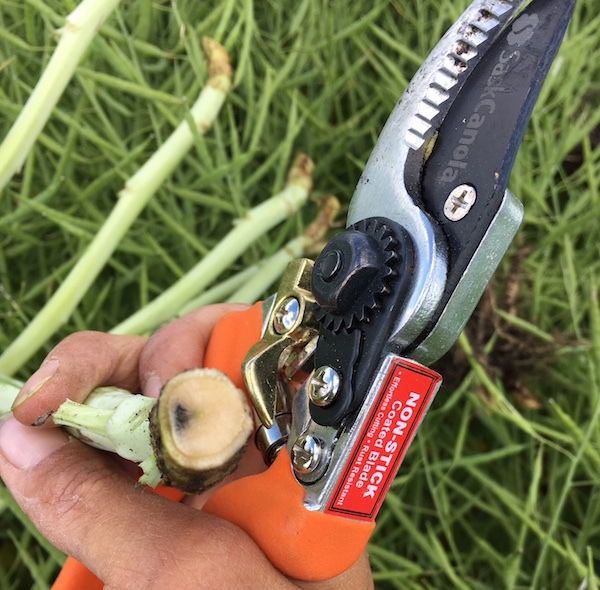 Also note that later into harvest, galls will decay and fall off the roots, making it harder to identify, so be sure to check your plants prior to this (so you can you know what level of clubroot plan you need to come up with) and can consider this when selecting a canola variety for the next time it is grown in this field. Also consider that you could very likely have clubroot without any visible symptoms above or below ground. Don’t wait until you see the symptoms; consider soil sampling to know if there are concentrations of spores in your soil. For other clubroot-related considerations, including prevention, management and disease cycle information, check out clubroot.ca. As a general rule, yield losses due to Sclerotinia stem rot will be approximately equivalent to 50% of the disease incidence. For example, if 10% of stems are infected, yield loss will be about half that — or 5%. Read more. For assistance, bring your CCC disease scouting guide to the field with you to scout and refresh your memory of the scouting techniques with these Pre-swath and post-swath disease scouting videos. While you are you in your field you can make the most of this time by also collecting a few plant counts. If you forgot to take your plant counts in the spring, this will at least give you an idea of your final stand. If you already counted in the spring, this number will tell you how many plants made it to full maturity.